Investing is best understood as a series of negotiations. The ability to conduct that bargaining with skill and confidence is worth a fortune. For example, if you overpay by two percent annually on an investment of one million dollars, assuming a return of seven percent per year, in thirty years it will have cost you more than four million dollars. With that much money at stake, you want to use tools that are recognized as world class. Negotiating Your Investments is about what you need to be smart and successful throughout the process. 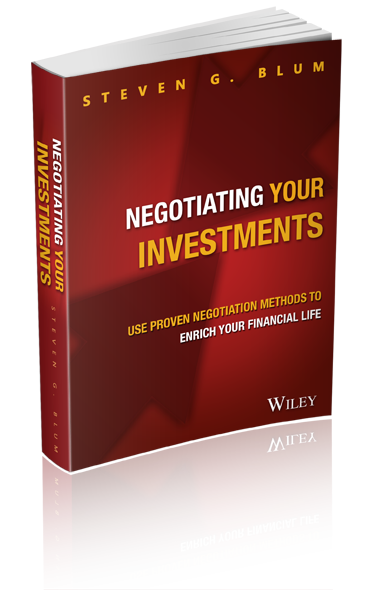 It is a guide to applying the science and principles of negotiation to your financial life. Most people don’t negotiate when investing, often thinking the process more like going to the doctor than working with a salesman. They fail to prepare, gather information, bargain, and gain commitment as they might in a recognized negotiation setting. Whether you are dealing with a true professional, a glorified salesman, or anything in between, this book will show you how to take charge of your most important financial deliberations. Author Steven G. Blum teaches readers the things they must understand going into such negotiations, methods for pursuing what they really need, ways to avoiding being taken advantage of, and techniques for getting others to fulfill their promises. He will guide you in recognizing and achieving best possible outcomes and putting dramatically more money into your pockets.